It was originally made by the request of Louis XIV, who – in the context of Jean-Baptiste Colbert's mercantilistic policies – was looking for a native French product to replace the then very popular Edam. To make it distinct from Edam he seasoned it with annatto to give it a sweet and nutty flavor and a distinct orange color. It normally weighs about 2 kg (approximately 4.5 pounds) and is made from cow's milk. Its name comes from the French word molle, meaning "soft". This refers to the softness of the crust when young – with age it becomes harder. It has a grey crust and orangish flesh. The orange color comes from the natural seasoning, annatto, which has a sweet and nutty flavor. The cheese has a similar appearance to a cantaloupe melon. 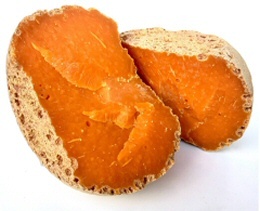 Mimolette can be consumed at different stages of aging. When younger, its taste resembles that of Parmesan. Many appreciate it most when "extra-old" (extra-vieille). At that point, it can become rather hard to chew, and the flesh takes a hazelnut-like flavor.